BB (beauty balm) creams have been increasing in popularity and showing up in more and more brands this past year. They originated in Asia and have been picking up momentum in the US. BB creams claim to improve your complexion and increase the brightness and luminosity of your skin. They have been largely limited to the higher end brands (Smashbox, Clinique) until Garnier debuted theirs just a few months ago! So far, I am really loving this product. It is right in between a foundation and a tinted moisturizer in terms of coverage. I was actually surprised at how much coverage this product gave! It really does help to even out your skin tone and lightly conceal blemishes while still maintaining an extremely natural look. Garnier claims this cream will give you an "airbrushed look." I definitely wouldn't go that far...but it is also very hydrating so this product is great for people with dry/combination skin. It's also perfect for people who are not fans of wearing foundation but want a little something to achieve a more even skin tone. This product leaves a very nice luminescent glow after application and doesn't sink into fine lines or show up heavily on the skin. I like it because it gives more coverage than a tinted moisturizer but it doesn't have the "made up" look of a foundation. I think this BB cream will be a great option for summer because it has the protective properties of SPF 15 and has the lightness that we want during the hot weather. Yet another perk is the shade-choosing process. It comes in 2 shades, light/medium and medium/deep. So all you have to do is choose your general shade and the product will blend into your skin. You shouldn't have to worry about it not matching your skin and looking unnatural. It almost goes without saying but one of the BEST features of this product is the price!! Smashbox's BB cream retails for $39.00 and Clinique sells theirs for $37! 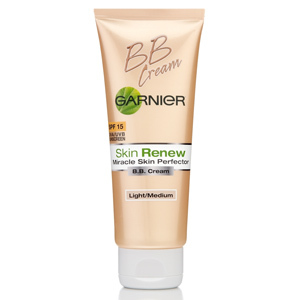 I picked up my Garnier BB cream on sale for $10.00 from CVS. Needless to say, I am super happy with this purchase thus far! Hope this was helpful!